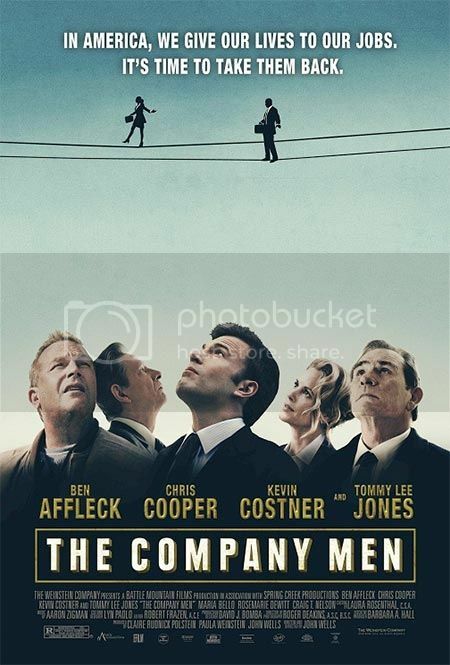 The Company Men is a fairly sober, paint-by-numbers portrayal of America's economic crises, as experienced by three recently-layed off upper middle class corporate suits. Its main value is less in its execution - which is straightforward bordering on bland - than in its peculiarity: you just don't see economics in Hollywood very much these days. Indeed, that's endemic to American culture: a complete purging of labor issues and economic strife from the collective cultural consciousness. Whoa, did we just sound like Gramsci? Anyway, this film's novelty value, along with the strong cast, merits a viewing. And it's an interesting follow-up to the much more class conscious Look Back in Anger; here too, class is an issue, particularly the appearance of it. A common statistic (fact!) is that Americans tend to over-identify with the middle class: everyone seems to think they're in it, even when many are not. In The Company Men, the facade of upper middle classness hides crumbling decay as three mid- to upper-level managers are progressively laid off from their cushy corporate jobs. Bob (Ben Affleck) is young and cocksure, but even his budding symbols of success - the huge house, the Porsche, the golfclubs - become a liability when he can't compete with fresh MBA grads, eager and able to work for lower salaries in a race to the bottom. Phil (Chris Cooper) is the old timey American Dream incarnate; a Vietnam vet who worked his way up from the factory floor to the six figure salary. And then there's Gene (Tommy Lee Jones), the heart and soul of the business and, it seems, the only honest businessman left in America (or Boston, at least). This focus on the pain of the upper middle class is restrictive, in some senses, but also very contextual; as we said above, most of America identifies with this class. The common laborer - here embodied with a pleasantly low-key, sardonic wit by Kevin Costner as Jack the Carpenter, Bob's brother-in-law - is given a much reduced role. He appears - and is decent, hard-working and honest. But his story is never really told, or even acknowledged. The cast is uniformly appealing and strong, even if the narrative doesn't allow them much nuance. It was great to see Chris Cooper, who we are most fond of; especially since we've been cultivating a fantasy film in our head starring him as a 1900s Chicago union organizer, David Strathairn as a slaughterhouse laborer and Paul Giamatti as a driven, exploitative yet compelling beef baron. Best movie evar?! You bet. And this one? Decent. Wait for DVD. Cultivate your fantasy Upton Sinclair adaptation instead.